…ANYTHING CAN HAPPEN! She might be going into business with her oldest friend – notorious lady-charmer Matt Brown – but men are definitely out of the question for Annie! 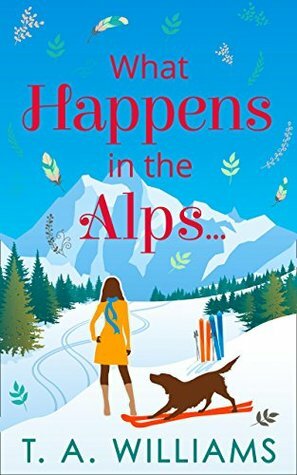 That is, until she bumps into tall, dark and delicious Alessandro Lago on the ski slopes…and spontaneously says ‘Yes’ to a date! I’m a big fan of T.A. Williams as he writes realistic modern romances with a female protagonist like a pro. I’ve read every one of his novels that has come out in recent years and loved them all. Unfortunately this one was not my favourite and I can’t really put a finger on why that was except that I didn’t warm to Annie in the same way I had warmed to the other female leads. I ought to have done…. she has independence galore and a determination to succeed. She has overcome the loss of a partner which is obviously heartbreaking… I just didn’t desperately want to have dinner with her. I had a hard time accepting her love interest. He didn’t seem to fit, though I liked him, and it was very obvious from the start that she should have been looking closer to home instead. What I did like about this novel was the setting- I loved the mountains, the lodges and the description of the snow. I liked the skiing, the rock climbing and the workings of a new ski resort. I felt completely immersed in the scenery. The trademark mad dog was present all over the mountain and he added a certain freedom to the plot and I adored Annie’s assistant- a completely original character. Maybe my issue was that I’m not a winter/ski girl? Maybe I didn’t warm to the novel because I personally prefer warmth and water? Perhaps that was it was but I certainly won’t let my mixed feelings about this story deter me from picking up the next T.A.Williams release!